Black Friday and Small Business Saturday deals extended through Cyber Monday!! Well, it’s official… the holiday season is upon us. And after a day of family and turkey (and in my case, probably more pumpkin cheesecake than I really need) the reality will set in… less than five weeks until Christmas. Now, I don’t know about you, but for me the idea of waking up early Friday to join the hordes of shoppers crammed into malls and stores is nowhere near how I’d like to start my holiday season (I’m picturing something with a little more sleep, and a lot more cocoa). Don’t get me wrong, I want to be sure to get my shopping done early… I just don’t think that a person should have to see the clock strike 3:00 twice in one day in order to get it done. So If you’re like me and want to find the perfect gift, but would much rather spend your Friday sleeping in, I’ve got a little something for you. And don’t forget that Saturday is Small Business Saturday! You can find unique custom gifts at many small businesses in your area. So don’t forget to support your locals! This is my first time offering such a deep discount… and I can’t promise it’ll happen again any time soon, so grab this deal while you can! 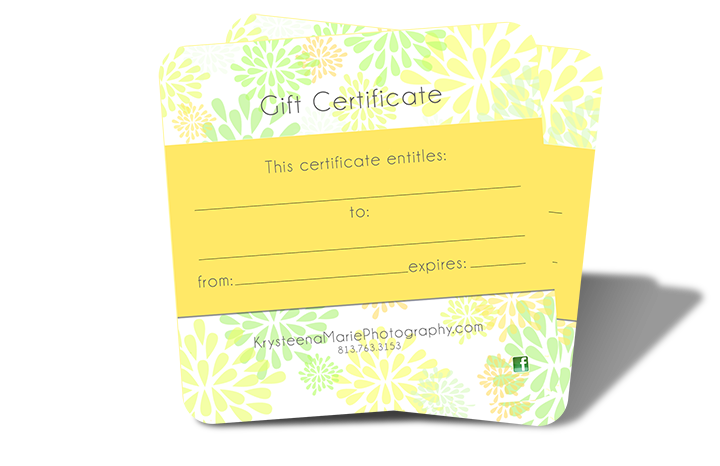 That’s right, if you’ve had a recent session simply use coupon code halfoff when placing your print order at krysteenamariephotography.com to get a 50% discount on your entire order. Whether you’d like to order a session book or disc, a canvas gallery wrap, or maybe some holiday cards from your recent session, contact me on Friday or Saturday to design and place your order and get 30% off your specialty products. Contact me if you have any questions or if I can help you place an order …and of course, happy shopping!